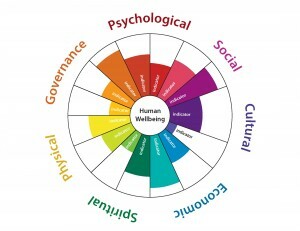 A “medicine wheel” graphic that will be used to showcase HWB indicators; copyright Biedenweg et al. The Puget Sound Institute (PSI) collaborated with the Puyallup Watershed Initiative (PWI) to develop a process for selecting human wellbeing indicators relevant to natural resource management in the Puyallup Watershed. The purpose of these indicators will be to monitor the state of Puyallup Watershed communities and to inform and evaluate integrated watershed strategies for key social impacts. The process involved several steps of compiling, creating, rating and refining potential human wellbeing indicators that related the values of Puyallup Watershed residents to the health of Puyallup Watershed ecosystems (Figure 1). These steps included 1) an analysis of values of Puyallup Watershed residents related to the environment from interviews and literature review, 2) a merging of existing Puget Sound indicators with Puyallup Watershed values, and 3) two ranking processes with the project team and Puyallup Watershed stakeholders. stakeholder workshop phase, 103 indicators were presented to 26 workshop participants in two workshops (Tacoma and Puyallup). From this initial list of 103, 34 were highly rated for relevance and importance. Data for some of these indicators are available from regional and national sources. Many, however, will require a regular household survey of Puyallup Watershed residents or independent analyses of existing data. If the PWI would like to monitor any of these indicators in consultation with partners and member governments, it will need to make decisions about how often these indicators are measured and how the information will be collected. -- This description is adapted from the report's Executive Summary. Biedenweg, K. & Harguth, H. (2014). Developing Human Wellbeing Indicators for the Puyallup Watershed. Puget Sound Institute, Tacoma, Washington.